Faculty, staff and students were overwhelmed with the stench in the old SAC last week. It made sinuses burn and eyes water. Sometimes a musty smell is in the hallways of the building after a rainstorm, but this smell was different. It was horrible. It smelled like sewer. “From the time I entered the building until hours after I left work, my head would ache. By Thursday, my sinuses hurt and my head was throbbing,” said Susan Polster whose office is in the SAC. She advises The Eagle newspaper staff and its lab is located in the building. I watched two maintenance people pump water and raw sewage out of the manhole in front of the SAC building Thursday into the sewer line located in the middle of the grassy area between the theatre and Reeves Building, she said. By Friday, the smell had not dissipated and Robbin Snow, The Eagle Station manager; Linda Davis and Debbie Prichard, cosmetology instructors; as well as Jan Thornton and Tammie Pantelakis, counseling office; all reported headaches and sinus issues. Prichard, Davis and Pantelakis are both getting nose bleeds with Prichard and Polster continuing with headache symptoms throughout the weekend while Thornton missed work the following Monday. In the weeks that followed, many of Prichard’s students experienced the same problems as the employees in the building. Jason Llewelyn, Carbon County Emergency Services and Homeland Security Director, was called by the residents of the SAC building to test the quality of the air in the building. He told the residents the gas level was low but the sewer gases will affect the olfactory nerves of the nose for between 10 and 15 minutes each time people enter the building. If you leave the building and come back, you experience the symptoms over and over. The sewer gases are not life threatening, he said, but definitely will cause the headaches and sinus problems the residents of the building were having. Because of the foul smell, Prichard cancelled her cosmetology department class for four days. She is worried about the health problems associated with the origin of the smell. Her three adjuncts all called in sick with headache, sinus and dizziness problems. Snow planned to put out the mail in the post office, but not stay after it was out. She closed the post office three days. 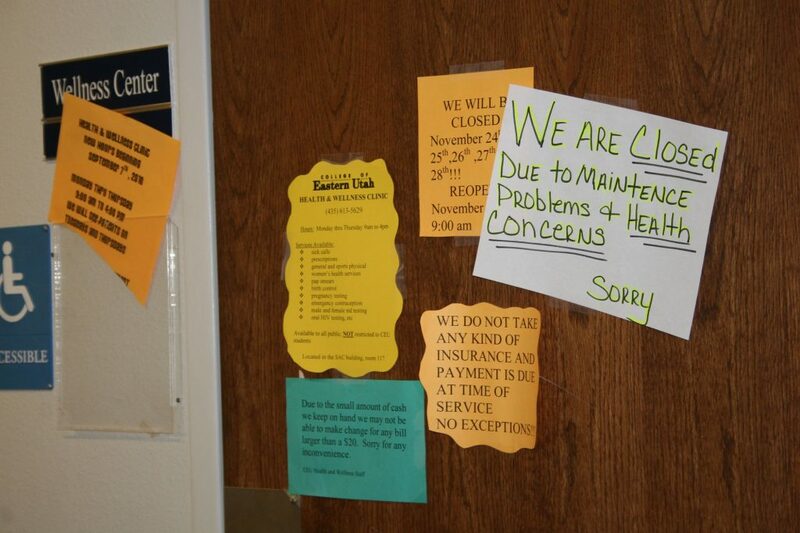 The Health and Wellness Center closed Nov. 3 and 4 and posted a sign on the door saying “Closed because of sewer problems.” Jan Thornton did not allow her part-time employees to come in for a few days because she did not want them to get sick. Prichard and Davis are concerned because if the air is toxic, they have two pregnant students in their program breathing it daily. In an e-mail to Polster on Monday, Nov. 1, from Sheila Burghardt, CEU maintenance supervisor, she wrote, “the problem in the SAC is a continuous one. The structural integrity of the building is failing as can be seen by the uneven floors and door frames. The smell was so bad, that Pantelakis in the Disability Resource Center, had to shut the main door to their office. “It’s hard for students in wheelchairs or use walkers or crutches to open a door. The SAC is always prone to have some interesting odors in it. Between the age of the building and the cosmetology program’s ever changing bouquet of products and processes it can be pretty fragrant. But the recent odors in the building have clearly been sewage related, communication faculty, Troy Hunt said. This is the second time in the past couple of years that there has been problems. A repair to the main sewer line leaving the building was done not that many months back. I thought that would solve for the problem, but when I walked into the building this last Saturday the smell was nearly overwhelming because the building had been locked up for more than 24 hours, Hunt said. SAC 107 is always problematic from an odor standpoint. Since the steam pipes that heat the building enter under that floor, the smell of damp and other things are often pervasive, he said. However last week when I opened the classroom door it was quite foul! There is an exhaust fan in 107 and I turned that on to make sure that air was being drawn through the building. When I came in on Monday the fan had done its job and the odor had abated. However, this is of great concern. At least my office has outside air conditioning so I can avoid the worst of the odors in the building, he said. Can’t they fix that? It was a problem when I was there in 2003.